Designing a small kitchen? Regardless of size, it can be the heart of the home. Making it functional as well as beautiful can often be a challenge, particularly when square footage is in short supply. The key to maximising the inches you have lies in good space planning and scrupulous editing. These six tips will help you make the most of your (small) kitchen space. Sometimes a curse can be a blessing. That is no more true than in old homes. Historic houses rarely accommodate large scale appliances, space to entertain or kitchen storage for all of modern life’s clutter. What they often do have in spades is high ceilings. Even a tiny room with a high ceiling can be made into a beautiful kitchen if you use the vertical space well. Building up with cabinetry is the most obvious strategy here but don’t forget to give those spaces some decorative love too. Bring the eye up with beautiful mouldings, a painted ceiling and/or statement kitchen light fixtures. Adding style above your head will make a big impact without wasting any floor space. If your small kitchen wasn’t graced with a high ceiling, you can still use the same concepts when it comes to vertical storage. Use wasted wall space for display and storage. When designing a small kitchen you not only have to think about designing the look of the overall space but also how each cabinet will be used. By doing so, you can use add-ons to make the interior of the cabinets more efficient and the workflow of the kitchen more effective. Consider the back of doors as hanging space, the underside of shelves for cup hooks and every inch of corner and high cabinets for occasional storage. Where custom building, use often overlooked small spaces like the cabinet toe kick, the area above doors and the ceiling for clever storage spaces. Check out our small kitchen storage ideas, clever pantry storage ideas and neat jar storage ideas for more inspiration. No matter how small your space, planning good kitchen lighting will go a long way to creating a safe workspace as well as a beautiful look. The right lighting plan will make all the difference. When planning kitchen lighting, you will need overall ambient lighting and task lighting at the very least. Adding decorative and spot lighting will also help make the space feel open and well planned. Consider how and where you’ll complete tasks in the space and light accordingly. Remember that the colour of your finishes will have an impact as well – the darker the cabinets, counters and walls, the more wattage you will need. The specific colour you choose is a completely personal decision but keep that choice to one or two predominate colours and you will create a feeling of a larger space easily. This technique also creates a more coordinated look without being a master decorator. Feel free to use different shades of the same colour as you mix and match to create some visual texture but avoid big blocks of contrasting walls so that the eye sees the room as one continuous unit rather than smaller blocks. 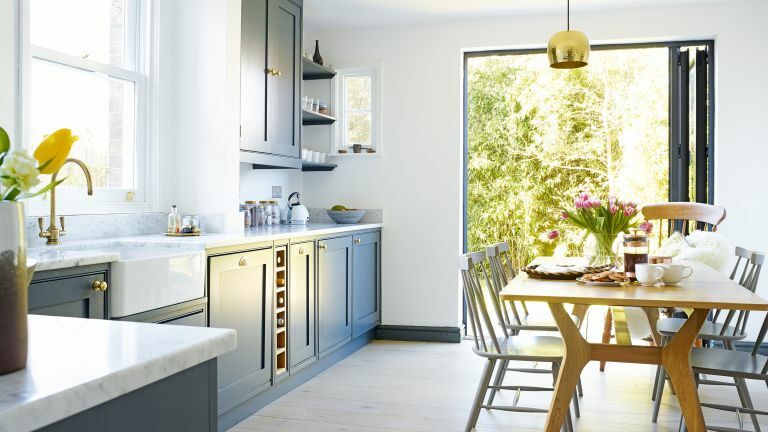 Get inspiration for your kitchen colour scheme in our feature. Be a ruthless editor. The less you have to store, the more organised and functional your kitchen will be. That means not taking grandma’s old microwave and investing in a compact microwave or keeping that extra crepe pan 'just in case'. Help yourself stick to this goal by creating a space for every single item you store in the kitchen. When you have run out of space, be strict with yourself and don’t allow one more item to come in until you have made room by parting with something else. Once you have a well-designed kitchen layout, don’t stop there. Treat the kitchen as you would any other room. You don’t stop decorating your bedroom with just a bed, why stop in the kitchen with just the cabinet and appliances? Used sparingly and in the right scale, small decorative touches really add personality and beauty to a kitchen. The right artwork display, cutting boards and even house plants will create a kitchen that reflects your sensibilities.